Senator Claro M. Recto, (supposedly by heart attack though not diagnosed of having any heart disease). 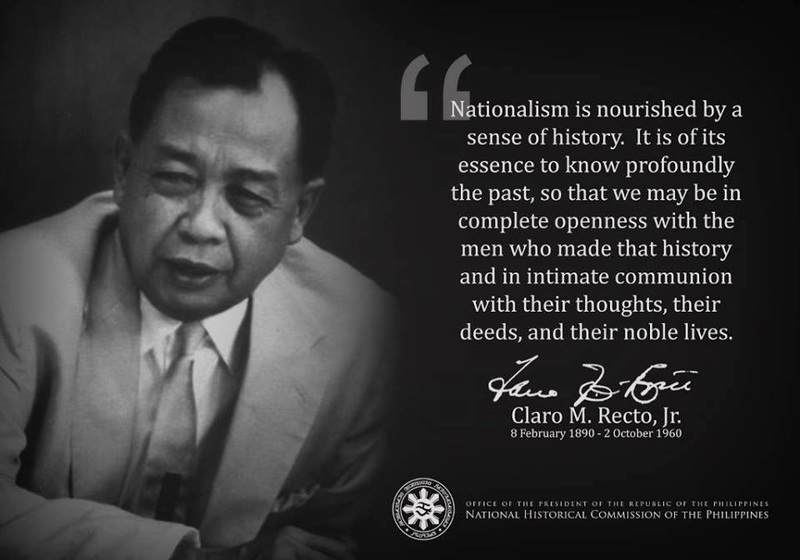 BTW, I was in the seminary at the time and remember our Father Rector expressing satisfaction that Recto was dead, whom he called a "communist." Hopefully, our homeland will have more of the likes of Captain Rene Jarque among the young. Last month, retired Brig. General Raymundo Jarque and wife, the captain's parents, were denied entry, jailed for two days in Texas and then deported. His wife was scheduled for a kidney transplant in the US. What does retired Army Brig. Gen. Raymundo Jarque think of military corruption, which his son and others fought against in various ways? What does he think has been achieved so far in this area, and what more does he think should be done? Former Brig. Gen. Raymundo Jarque and his son Rene, a former captain – both of the Philippine Army – share the distinction of eventually becoming staunch critics of the high military leadership. The older Jarque shocked the nation in 1995 with his defection to the communist New People’s Army (NPA). His defection, he explains, was brought about by trumped-up graft charges against him by his fellow officers. For two years the older Jarque lived in the hills of his native Negros Occidental, after which he surfaced to become a consultant of the National Democratic Front of the Philippines (NDFP) in its peace negotiations with the Government of the Republic of the Philippines (GRP). He is now back in mainstream society, though he shows no signs of regret that he ever went over to the other side, and is still being quoted in media interviews as saying that the NPA is better than the AFP. The younger Jarque witnessed military corruption early on, just shortly after he graduated from the U.S. West Point Military Academy in 1986. He joined the 1989 coup attempt in earnest desire for military reform, and when that didn’t work out he turned to writing hard-hitting articles in the various publications of the Armed Forces of the Philippines (AFP). Because of these, he was subjected to various forms of harassment and was even placed under surveillance. Disillusioned, he left the military fold in 1998, but he didn’t stop trying to push for reforms in the AFP. He continued writing articles against military corruption, this time for the national newspapers and magazines, and even joined anti-corruption groups like Action against Corruption and Tyranny Now (ACT Now). His sudden death, from cardiac arrest, last Aug. 19 came as a shock to many. He was just two months short of his 41st birthday. This writer went to Rene’s wake and was able to talk to his father. What does he think of military corruption, which his son and others fought against in various ways? What does he think has been achieved so far in this area, and what more does he think should be done? Capt. Rene Jarque was known as a staunch opponent of military corruption, and his advocacy proceeded from incidents he himself had witnessed. Did you also witness incidents of corruption in the military during your time as a young officer? There already was. During my time, there were sporadic practices of corruption. It came to the point where the level went higher and higher, because the higher headquarters saw that they could produce money out of conversion. But actually, how come there is conversion especially in the Army? When I was a battalion commander in Cotabato, we needed money. Example, you have an operation today and you have a budget for one week and after that your sardines run out, your rice runs out – so the operation is continuous and your supplies are all used up. So if you have no cash and you are, for example, in the Liguasan Marsh, your troops would not be eating anything the next day, or you would loan for food. If you loan, you would have a problem if you have no receivables, for what is your guarantee then? And normally, if you request for additional budget, it takes time, because you have to send the request and what will reach you is a piece of paper. But you have to eat and your troops have no more rice. So to accelerate the process, the commanders are allowed to convert procurement into their cash equivalent. For example, you have on paper a procurement worth ten pesos and you want it converted into cash. But you also lose something there: for example you bring the paper to the store or to the supplier, of course they should also profit from that. Out of ten pesos, you get only eight while they take two, because that is like a ghost purchase. But that time we were only talking in small amounts, only thousands, needed by the troops. But there were some people who became “wise” and the practice went to the higher levels and we were now talking in terms of millions. But tactically I’m in favor of that because the commanders need money immediately for necessities of operations. But only in amounts just enough to feed your troops. But to convert money for your personal use, that cannot be done in our time. Say you’ll convert ten thousand pesos. Can you build a house with ten thousand pesos? But now it has come to the level where we are now talking in millions. It has reached Camp Aguinaldo. Senior officers saw that they could control the release of funds. So during your time there was already the practice of conversion but that was only for immediate needs? There already was, so those who are being interviewed by the media saying there was none, they are liars. The people must understand that when you’re in tactical operations, the lives of soldiers are at stake. But their lives are simple, you only have to feed them. You can’t convert guns and ammunition because they’re there. They need only rice and other food items. But you need cash and you’re already in the field. The sari-sari stores won’t loan out. So with the level of conversion in my time as a young officer, you can’t get rich with it. Because we were not talking in millions then. To the best of your knowledge, when did it begin to reach such high levels? The practice started to reach high levels in the 1980s, and from there there was no turning back. The latest development is that we have Gen. Carlos Garcia getting into the hot seat for conversion. If he wasn’t caught by U.S. Customs, the extent of conversion would not have been exposed. You had no news of it. In the simplest terms, he was caught in the act. But as of now, the practice continues. And the people are blind to the excessive wastage of our budget, especially our military budget. It was just that General Garcia was caught in the act. We have to put up strong measures now on how to cut down that practice. What do you think are the specific measures that can be imposed to cut down on conversion and other forms of military corruption?One of the measures would be the abolition of the comptroller-ship The office should be scaled down. Because I remember, when I graduated from the Philippine Military Academy (PMA) in 1961, I reported to the comptroller, which was then only a section of the G4 or logistics. But during the time of Gen. Fabian Ver as AFP chief of staff, they made the comptroller co-level with the other staff officers. There is a saying that “He who has the gold controls the world.” So others saw that there’s gold in the comptroller-ship Because the comptroller can just give you whatever he wants to give you. You need 100 pesos, he can give you just five. The comptroller became powerful. So was former Navy Capt. Dan Vizmanos correct when he said that military corruption became massive during Martial Law?Martial law? I don’t know if it was massive, but of course during Martial Law, everything was under control. Everything. That brought about the existence of the Reform the Armed Forces Movement (RAM). One of its issues was corruption. Because at that time only General Ver and his minions were controlling the Armed Forces. At that time you couldn’t tell what was going to happen with your military career. Retire-able officers’ terms were being extended for as long as 10 years, 15 years, that was what was happening. Rene joined the 1989 coup attempt with the intention of pushing for reforms in the military. If you’re willing to answer this, on which side were you when it broke out?I was on the government side. I was a division commander. My view then was that I would no longer join such attempts. EDSA was over and there would be chaos again. How did you feel that there was this coup attempt in 1989 and you were on the government side and your son was on the other side?I didn’t really feel critical about it because the Visayas where I was assigned is very far from Manila and the only action was in Manila. It was so far from our division.If the coup plotters had won – there is a saying, “To the victors belongs justice.” If they had won, what do I do except to keep quiet about it? They want me relieved from the division, let them relieve me. They want me charged, I’d ask for what offense. But I was thinking, maybe they’d take pity on me because I didn’t fight them, I was in the Visayas and they were in Manila. My troops didn’t move. After 1989, Rene’s efforts to promote military reform were through writing, and he was subjected to various forms of harassment. Yes, the senior commanders got angry. Maybe they were included in the articles. Every so often there are people like Rene who exert efforts to promote reforms in the military – by whatever means, by any of the two means that he chose to take. What, in your observation, have they achieved in terms of fighting corruption in the military? According to the news releases of the AFP, some progress has been made in that area. I read in the newspapers that the finance people are now being made to report directly to the chief of staff. I don’t know if there is now a stronger audit control. What do you think should be done so that there could be far-reaching and long-lasting reforms in the AFP?You have to revise old policies. There should be legislation so that corrupt officials know that their practices are punishable by law. One of the things I remember Rene saying is that nothing short of revolutionary could reform the AFP. Would you agree with him on that?It depends on how “revolutionary” is defined. He must have been thinking of something that is really radical, so the means could be peaceful but the solution is radical. In one of his latest articles he was talking of the constitutional soldier. The soldier must protect and defend the Constitution. Rene Jarque’s legacy to the struggle to bring about an armed forces that will truly serve the interests of the people and the country is surely enshrined in the hearts and minds of the patriotic men and women in uniform. Indeed, he has served his people and his country well and we are all very proud of him. Former army captain and West Pointer Rene Jarque, eloquent and outspoken advocate of reforms in the military establishment, is dead at age 40. In his abbreviated life, Rene had metamorphosed from being a young, idealistic officer aiming to follow the footsteps of his father, General Raymundo Jarque, in a distinguished military career, to that of a crusader, seeking an end to the scandalously corrupt, shamefully inept and intolerably abusive armed forces which he had been a part of and gotten to know and understand well. It is one of the ironies of life that Rene Jarque’s path and mine should cross in a rather unique and non-adversarial context. I first met Rene in 1995 as he dutifully accompanied his father, General Jarque who, after having defected to the New People’s Army, came down from the hills of Negros to face the criminal charges leveled against him by feuding landowners and then Public Prosecutor Aniano Desierto. I was part of a party of lawyers and activists that met the General and provided him moral, legal and political support as he faced an uncertain and risky future. I must admit a measure of wariness when I met this army officer; my activist instincts told me that despite his natural sympathy to his father’s plight, it could not be assumed that he had become open, much less sympathetic, to the Left as well. Our conversations were light but guarded; he struck me as an intelligent, soft-spoken, respectful and non-confrontational person but I reminded myself that I was talking to a dedicated and loyal military officer. I would hear about his military career suffering in the years to come; he had been quietly placed in the freezer. Perhaps it had something to do with his father’s spectacular defection to “The Enemy” that had indelibly marked Rene as a non-conformist and potential troublemaker. Certainly, his critical views about corruption, lack of professionalism and mismanagement in the AFP that he wrote about unabashedly in military publications sealed his fate. It came to the point that copies of a military journal that he edited, was embargoed and set to the torch because it contained an article exposing corruption in the military and calling for reforms. After Rene had prematurely been forced to retire from the military in 1998 and had started a new career as a business executive, I ran into him again and learned that his passion for advocating wide-ranging reforms in the military had not waned. Thereafter he would be tapped as a resource person by the Bagong Alyansang Makabayan, In Peace- Mindanao and other progressive groups especially after the so-called “Oakwood Mutiny” in July 2003 to explain what was going on in the military. In November 2003, Rene helped convene the Action Against Corruption and Tyranny Now or ACT NOW!, an alliance of personages and groups that was appalled at the corruption during the incumbency of President Gloria Macapagal-Arroyo and vowed to animate a citizens’ movement against government misrule, abuse and corruption. Upon the initiative of Rene, the newly-formed anti-corruption network wrote an open letter to the officers and men of the AFP calling on them to put a stop to the practice of “conversion”, literally converting public funds into private monies by a series of criminal acts that involved the collusion of military officials and private supply contractors and appropriating said funds to enrich themselves. This was long before the scandal over the billions of money allegedly siphoned off by General Carlos Garcia and his cohorts using the strategic office of the military comptroller. Rene had hoped it would send even a small ripple of appeal to the remaining decent elements in the military establishment. He also brought up a proposal to hold small forums inviting enlisted servicemen and not just officers “to serve as an outlet for soldier's grievances besides the PMAAA and the AGFO” and to provide a venue for the men in uniform to meet with leaders of cause-oriented groups and exchange views. He had hoped such efforts would help lift the veil of misconception and prejudice that beclouded the mindset of each side. I learned that Rene had resigned from his executive position in a Manila-based firm and had accepted instead a job that required him to be based for the most part in the Indonesian capital of Jakarta. In the time that he was back home, we had an opportunity to speak at the same forum on corruption in the military in the wake of the case of Gen. Carlos Garcia and other implicated officers. We also attended the first hearing of the military tribunal trying Gen. Garcia’s case. I could feel the questioning looks of military men as they saw me enter the courtroom with the famous or notorious Captain Rene Jarque, depending on one’s point of view. In February of this year, ACT NOW! invited Rene to deliver a paper on corruption in the military at a National Study Conference on Corruption held at the University of the Philippines. He graciously agreed and since he was abroad at the time, he was hooked up via long distance to answer questions raised during the open forum. Bishop Julio Labayen was at the conference and asked Rene how he explained the phenomenon of reform-minded officers in the AFP as dramatically revealed in the recent “Oakwood Mutiny”. Rene’s insights impressed the good bishop who remarked that he was hopeful for change in the AFP with advocates such as Rene persisting in his awareness raising efforts. Captain Rene Jarque certainly belongs to a distinguished breed of Filipinos because he had the courage of his convictions, a moral courage displayed in the risky but principled choices that he made that affected adversely “success” in his chosen career and even his personal fortunes. Moreover, he persisted in his crusade while he could have quietly faded away from the controversial limelight when he was effectively forced to resign from the institution he loved and served to the best of his ability and with his integrity intact. He was able to maintain his links and command the respect of his peers and other active and retired military officers precisely because, even when they disagreed with his views, they could not doubt his moral integrity, intellectual honesty and willingness to make the necessary sacrifice to advance his convictions. Rene was a rare kind of intellectual: he was a critical thinker who could not be satisfied with what has been ingrained in him but was open to the truths that he learned as he matured, from his experiences as a young officer fighting a counter-insurgency war in the hinterlands of Isabela province to his stint as a staff officer with a promising career in the AFP headquarters to his “downfall” as a maverick soldier railing against an institution that had gone terribly awry. Rene was broadminded enough to respect the views of those in the revolutionary movement whose ideology and politics were diametrically opposed to what he had been molded to believe but whose basic values and concrete practice he had grown to admire. Captain Rene Jarque remained a soldier at heart which is why he never gave up writing and talking about what he felt was wrong in the military. He also never gave up on the decent people he knew remained in the AFP. “There is indeed a dilemma. Military intervention can restore order but… if the intervention is by the generals, no real change in politics and society will happen. In fact, it could be worse if a military or military-controlled government takes over… If the young officers intervene without the blessing of the chain of command, it will be a bloody confrontation with the “pro-government” forces. The Armed Forces of the Philippines once again is at a crossroad following the cases of [Major] General (Carlos) Garcia and Colonel (George) Rabusa. How this will play out will determine the seriousness, direction and tempo of eradicating corruption in the military and promoting professionalism in the ranks. We have known the rottenness of the system all along and how the culture in the AFP was not and is not conducive to professional growth and honest conduct. It was never reflective of the Academy's motto, "Duty, Honor, Country." Some of us gave it a chance, found it unwieldy and incorrigible and left. Some stuck with the system and played it out only to be sucked into the vortex of corruption and unprofessional conduct. At one time when I was at the Department of National Defense, I told General (Narciso) Abaya, "Sir, I am sure that I can fulfill the Duty and Country part of the motto but certainly the Honor part is very difficult to do." I was trying my best to be as professional and as patriotic as I could be, but I could never be honest given the extent of the graft and corruption in the AFP. And that was, I believe, unacceptable to my sense of honor and integrity. Hence, I left. I have been called many names, reviled and hated by many officers for my intransigent stand against corruption in the Armed Forces ever since I was a lieutenant. I was branded a rebel and an unprofessional officer. I was called a liar in public by a former Chief of Staff. Some of you may have also hated my guts for being so stubborn and for being part of the opposition. I was not and am not being stubborn for the sake of stubbornness. I am stubborn because I believe in the righteousness of the cause. It was and it is the right advocacy, and an honest one. The lives of thousands of soldiers and their families depend on this cause. The future of our country depends on whether this advocacy will win in the end. While many of us turned our eyes away and covered our ears, I believed that someone had to play the "bad guy" to make sure that the message was not lost. A wise old philosopher went to the village to preach the good news. He proclaimed his news loudly but no one would listen. Time passed and he continued to preach even louder but still no one listened. One day, a child asked, "Mister, why are you preaching even louder, don't you see it's pointless? No one is listening." The philosopher replied, "My child, at first I thought I could change them and so preached loudly. But now I am preaching even more loudly so they don't change me." Yes, we have all been part of the system and by our action or inaction, we have all been party to unprofessional conduct and corruption in the AFP. One way or another, we have taken advantage of the system. You all know your indiscretions as I know mine. There was no choice then, there was no other way if one wanted to survive and pursue a "progressive military career." But if a progressive military career means a regressive character and dishonor, well, many of us found that unacceptable and the only option was to leave the service. I love being a soldier, being with the men and fighting for our country. But it cannot be at the sacrifice of honor. What is the meaning of fighting for your country when the chain of command consists of thieves and looters, insensitive to the welfare of the soldiers and their poor families? What is the meaning of dying for your country when you know that the government and the politicians are apathetic toward the people and the so-called rebels or terrorists we are killing and even torturing are just protecting their lives and their dignity, when they are just trying to survive? What good is fighting for the country when the rebels are right that this country is governed by a callous elite, an abusive military and a corrupt government? To me, there never was, there never is, and there never will be honor in killing desperate men--men who have found no other way out of their poverty and suffering but to join the rebels because the leaders they have chosen to lead them and the soldiers who are supposed to fight for them, are not doing their duty. For after all, aren't the soldiers the protectors and defenders of the people? I appeal to your sense of Duty, Honor, Country in saying that we must do something as a West Point Society, as an association of honorable men. The least we can do is make a public denouncement of the corruption in the Armed Forces and appeal for the reform that has long been needed in the AFP. We should tell General Narciso Abaya, West Point '71, that the right thing to do is the honorable thing. Covering up, spinning stories and whitewashing are not honorable. This entails a great risk especially in our friendships and camaraderie, but we must be comrades blinded by Duty, Honor, Country. Somehow, we have to take a stand and make a choice or live a lie within ourselves as long as we live. Duty, Honor, Country, my fellow West Pointers. (Signed) Rene Jarque, Class of 1986. It never did, and never will. "- Fr. Pedro V. Salgado, O.P. Many churches in the USA are looking for the right sources of church mortgage in USA for the churches. I recommend Griffin Church Loans. It has changed the financial life cycle of many churches.